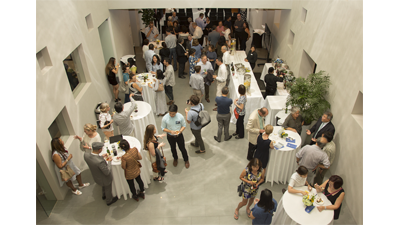 The Terasaki Research Institute (TRI)’s recent Grand Opening celebration, honoring the research and legacy of Dr. Paul Terasaki, was an exciting opportunity to introduce some of the many innovative projects going on at the Institute. The creative workforce behind these projects was present as well, as guests had the opportunity to engage with the group of scientists, researchers, and individuals collaborating together to change the world of transplantation. In addition to the TRI team, the Terasaki family, doctors, educators, researchers, the architect of the beautiful TRI building, and even an accountant involved with the finances of the building were all present to honor Dr. Terasaki and his legacy. Guests were invited because of their relationship with the Terasaki family or their involvement, on many different levels, in establishing the Institute. It was an enjoyable day where everyone came together. One guest said, “It’s so interesting talking to everyone, finding out who they are and how they’re involved. Everyone played a role!” Another said, ‘I’m a problem solver, and I’m very excited about working with such an innovative group of people on some unique problems.” Everyone there had reason to be proud of being involved in launching TRI’s efforts and all were excited to hear about future initiatives and projects. 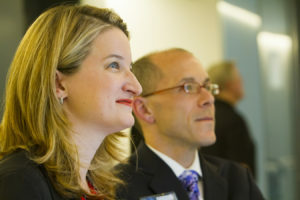 Guests listened to speeches from key individuals, and perhaps gained new perspectives on the future of organ transplantation. During the event, TRI’s Director, Matthew J. Everly, PharmD, talked about his vision for TRI, which includes using innovation and collaboration as the pathway to a future where all patients that need a transplant receive one, organ transplant failure is eliminated, and patients and donors are provided with adequate transplant education resources. By building an infrastructure, conducting research, and implementing new initiatives with Deputy Director, Amy D. Waterman, PhD, TRI will help patients and donors across the globe. Dr. Gene Block, Chancellor of the University of California, Los Angeles (UCLA) also spoke at the event, describing the close relationship the university had with Dr. Terasaki, and how that collaboration will continue to support TRI’s vision and growth. Other notable speakers that day included Dr. Keith Terasaki, Chairman of the Terasaki Family Foundation; Dr. Steven Hardy, President of TRI; Dr. Hitoshi Abe, Director of the Paul I. & Hisako Terasaki Center for Japanese Studies at UCLA and architect of the TRI building; Terasaki family attorney Robert Kopple, and George Ayoub, former CEO of One Lambda, Inc., a company at the forefront of transplant diagnostics, which was founded by Dr. Terasaki in 1984. The launch of the Institute has also helped Dr. Waterman’s Transplant Research and Education Center (TREC) team to grow in recent months. TREC is moving forward with health education programs, Explore Transplant and Explore Living Donation, to provide education that will allow kidney disease patients, and potential live kidney donors, to make an informed decision that is best for them. Guests had the chance to look at these education programs, with co-creator and nephrology social worker Christina Goalby, MSW, from Health Literacy Media, explaining the materials. Explore Transplant and Explore Living Donation materials. The TREC team was also excited to introduce StoryTap, an educational tool that allows individuals to share their personal stories by recording a short video on their smartphone or laptop. Attendees at the event watched videos of kidney disease patients and living donors sharing an authentic description of their kidney transplant experiences. Representatives from StoryTap flew in all the way from Canada for the event, and were on hand to show the technology, and to record videos of the attendees who gave their thoughts about attending the Grand Opening, transplantation, or whatever they wanted to share. These exciting demonstrations are just a taste of what is occurring at TRI, as it develops into a facility that will foster the creativity and teamwork needed to allow progress to occur. The Grand Opening event helped guests get a glimpse of the teams of dedicated and brilliant people working together to help patients around the world, and they left the event with these three words in mind: collaboration, innovation, and passion. TRI is thriving, and building a bridge to a better future. To see Dr. Everly’s speech click here. To see Dr. Waterman’s speech click here.